In this sixteenth archive story by Kristian Bertel, we are traveling to Jaisalmer in Rajasthan, India. A city that also goes by the name 'The Golden City' because of its many buildings made of yellow sandstone. Read the background story of this archive photo by the photographer. The dramatic and romantic desert fortress of Jaisalmer is an exotic city in Rajasthan's great Thar Desert. 'The Golden City' rose to prominence as a result of its position on camel trade routes. It's now most famous for the 12th-century fort and ornate Havelis, which are fine merchant-built houses and pavilions in the city's medieval lanes. The surrounding Desert National Park offers opportunities to observe blackbucks, desert foxes and chinkaras amid the rolling dunes, rugged crags and waterholes. The stark, compelling beauty of the Thar Desert draws travelers to far-western Rajasthan for good reason. Jaisalmer is a picture-perfect medieval city resplendent with golden homes and havelis and a towering citadel, which is an intriguing town in its own right, and is an excellent base for camel safaris into the desert and for day-trips to the photogenic Sam Sand Dunes and Desert National Park. It is easily one of India's most unforgettable destinations, and well worth the journey to this farthest corner of the state. 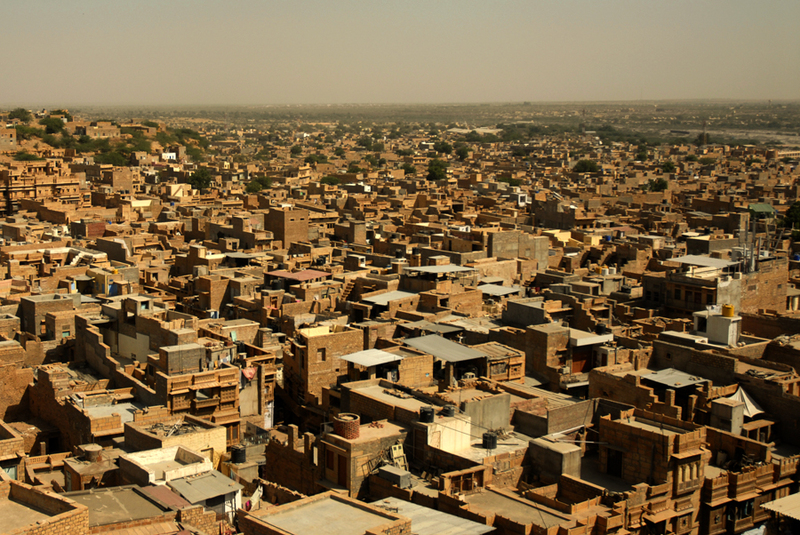 Unlike Jaipur and Jodhpur, with populations in the millions, Jaisalmer is very much a tourist town, with a population of about 80,000. In fact, a significant portion of the population is only there in the tourist season, four months out of the year. The rest of the time they go off to find work in larger towns in Rajasthan. Thus you can expect to see that the inhabitants are very intent on selling you things. As anywhere in India, try to stay calm and not get irritated, as getting angry never helps the situation. Keep in mind that they can also be extremely friendly, chatty, and genuinely helpful, so be positive when in the city and have a good time. Visiting the Jaisalmer Fort the photographer entered through three massive gates in the majestic walls. Up, up, up till you reach the majestic palace and all the old temples. This is the first time he visited a fort which is described as a living fort with families. This means there are houses inside the fort and people actually live there. Once you are inside the fort, it is easy to think you are inside a small town rather than an old fort. The fort is like a separate town altogether. You have shops, houses, restaurants acyually almost everything. Unfortunately this somewhat takes away the charm of an ancient fort like for example the Mehrangarh Fort located in Jodhpur, a fort the photographer also visited. The Jaisalmer Fort can get noisy and crowded inside the fort and you have have to watch your step lest you step on cowdung or some construction materials. The architecture of the Jain temple inside the fort is superb and so are the Kings and Queens palaces. Having a guide with you will help and you'll learn what the various places are for. You will learn the history of the canons and how the soldiers defended the fort against attacks. It is possible to spend hours walking around the various lanes inside the fort. Our guide told us that some of the people living belong to the same families that lived so many years ago. If the fort is kept a little cleaner and well maintained, it will definitely be a priceless jewel in the crown of Jaisalmer. As a photographer you do not need a map. It is wonderful to just stroll around in the old arcades, looking at the old houses clustered together. Taking in the livelyhood of the locals living here like they have always done. The light is amazing for pictures around sunset when the sandstones glows in their warm colors. Jaisalmer Fort is also known as the Golden Fort and is one of the largest fortifications in the world and absolutely breathtakingly beautiful . It was built in 1156 AD by the Rajput ruler Rawal Jaisal, from whom it derives its name. Rawal Jaisal's son was Shalivahan II and Manj and Bhati Rajputs are descended from him. Today, it is a world heritage site and the fort stands amidst the sandy expanse of the great Thar Desert, on Trikuta Hill, and has been the scene of many battles. Its massive yellow sandstone walls are alight tan color during the day, and as the sun sets it turn into a honey-gold. India is a land full of stories. On every street, on every corner and in the many places in India, life is rushing by you as a photographer with millions of stories to be told. In the archive story above, you hopefully had a readable insight in the story that was behind the photo of Jaisalmer. On this website of Kristian Bertel | Photography you can find numerous travel pictures from the photographer. Stories and moments that tell the travel stories of how the photographer captured the specific scene that you see in the picture. The photographer's images have a story behind them, images that all are taken from around India throughout his photo journeys. The archive stories delve into Kristian's personal archive to reveal never-before-seen, including portraits and landscapes beautifully produced snapshots from various travel assignments. The archive is so-far organized into photo stories, this one included, each brought to life by narrative text and full-color photos. Together, these fascinating stories tell a story about the life in India. India, the motherland to many people around the world, a land of unforgetable travel moments. The archive takes viewers on a spectacular visual journey through some of the most stunning photographs to be found in the photographer's archive collection. The photographer culled the images to reflect the many variations on the universal theme of beauty and everyday life in India. By adding these back stories the photographer's work might immensely enhanced the understanding of the photographs.